Struggle with initial concept design & engineering in terms of fit, function and ease of manufacturing. Concept refinement, materials exploration and scale study that produced a streamlined, production-ready design with enhanced product functionality and aesthetics. Simplification of joint fittings and branch structures for successful function and ease of play and assembly. Added asymmetry that enhanced the overall aesthetic and provided a more organic and child-like appeal. Provided a more cost effective solution through the elimination of unnecessary components associated with the original design. Standardized parts and sizes for more streamlined production. Creating a start-up can be exciting and rewarding, but it comes with its challenges – especially when it involves new product development. Oftentimes, it is easy to develop tunnel vision when working on the design and engineering of a product. Learning Beautiful is a start-up company founded by an MIT Graduate & Research Scientist at MIT Media Lab. With limited resources, the founder and her team set out to design new learning materials for children that would break down the fundamentals of computer science into a collection of tangible, hands-on educational toys. Prior to working with Empire on this project, the team had done all of the design work in-house in their fabrication lab at MIT. Despite laboring through many iterations, they weren’t quite nailing the design in terms of function, usability for children, and ease of manufacturing. Acting as an extension of their team, Empire Group’s talented pool of Industrial Designers and Engineers were able to bring a fresh perspective to the product design and development process. 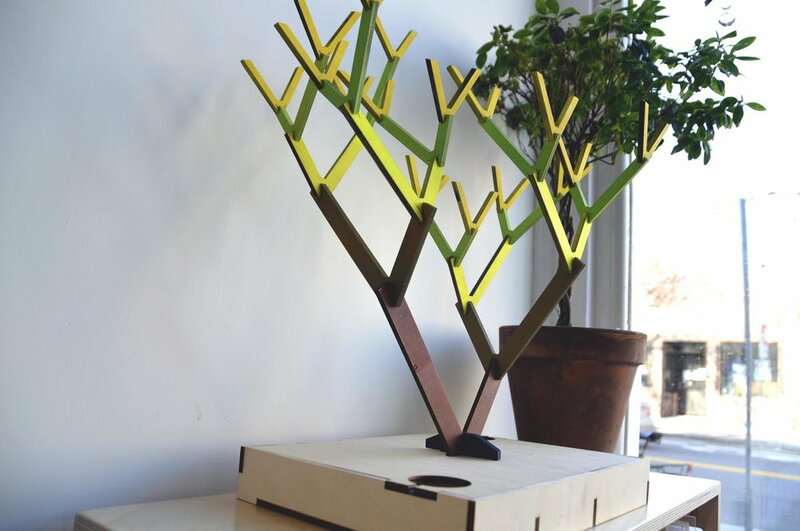 The team at Empire worked with Learning Beautiful to refine their initial concept design of the Binary Tree through design adjustments, material exploration and scale studies. The project involved a multidisciplinary approach, utilizing multiple facets of Empire Group’s Product Development services, including Design, Engineering, and Prototype. Empire Group also assisted in the same fashion with a number of other products including the company’s Binary Towers, Pixel Boards, Binary Cards, Programming Boards and Logic Gates. As a result of Empire Group’s services, Learning Beautiful was able to take an idea, create a strong prototype, and move it quickly to production. The company is currently in the middle of their second manufacturing run. With the original design intention in mind, Empire Group’s Design & Engineering team, was able to simplify the joint fittings and adjust the tolerances of the branch structures of the Binary Tree for successful function and ease of play and assembly. The team then continued to explore the geometry of the components and present an improved asymmetrical structure that enhanced the overall aesthetic ─ providing a more organic and child-like appeal. Empire then infused additional value into the project by standardizing parts for more streamlined production as well as re-imagining the Binary Tree’s base to eliminate unnecessary components, and therefore, potential costs. One of the factors that lead Learning Beautiful to work with Empire Group was the wide range of services we provide. Empire Group’s interdisciplinary capabilities in product design and engineering, prototyping, additive manufacturing, CNC and graphic design allows our team and our customers to produce parts, prototypes, and final products at an accelerated pace without a loss in flexibility, agility, or quality. Need Design & Engineering Assistance? Older PostMeet our Intern Hailey!